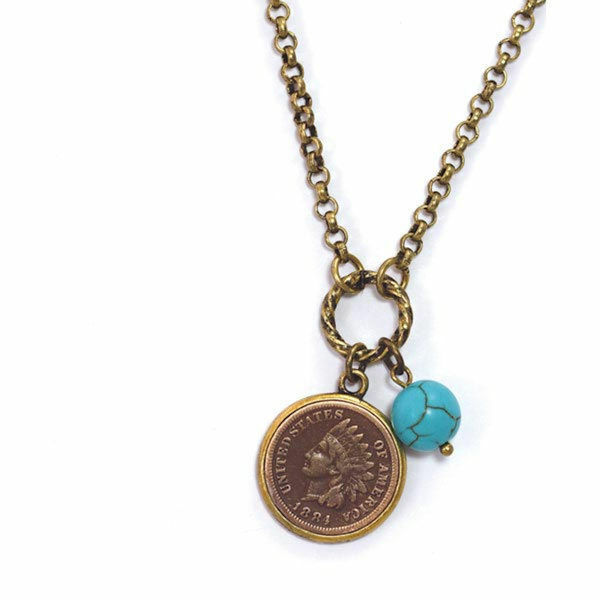 Turquoise and copper together bring out the natural beauty of the Indian Head Cent Pendant. A genuine Indian Head Cent minted from 1859 to 1909 is the focus of this earthy piece. The copper coin featuring Liberty wearing a headdress and a real turquoise bead hang from an 18 inch coppertone bold link chain. A Certificate of Authenticity is included. Allow 2-3 weeks for delivery. No rush delivery or gift box. Item can only be shipped within the Continental US.